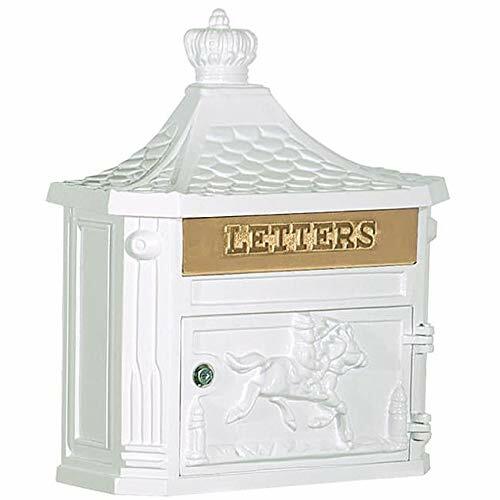 Made of die cast aluminum, Salsbury Victorian mailboxes add a timeless design to compliment any home. Features a classic Pony Express design and can withstand all types of weather elements. 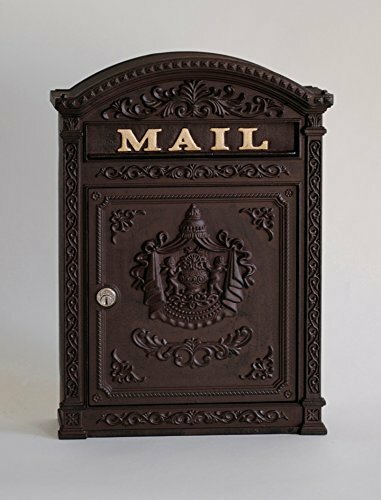 Each mailbox has an inward swinging brass mail slot embossed with "LETTERS" and includes an adjustable stop that can limit the size of the mail flap opening. Two (2) mounting holes for easy surface mount installation is available on the rear of each mailbox unit. 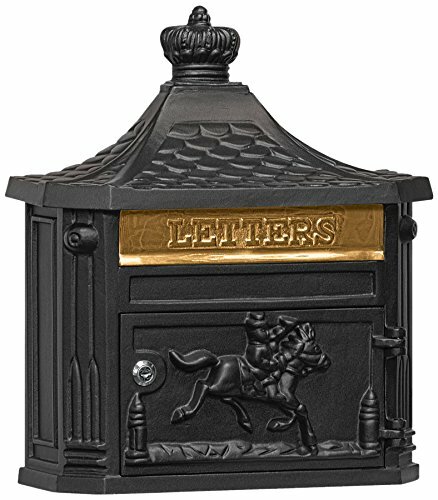 These lovely Victorian style mailboxes are available in durable powder coated black, green, beige and white. 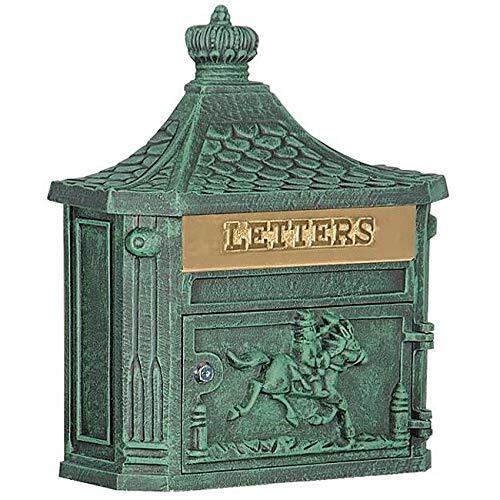 Color: Bronze;Size: 17.5H x 12.25W x 3.75D Die cast aluminum, powder coated finish, locking with 2 keys Available in rust brown, bronze and satin black. 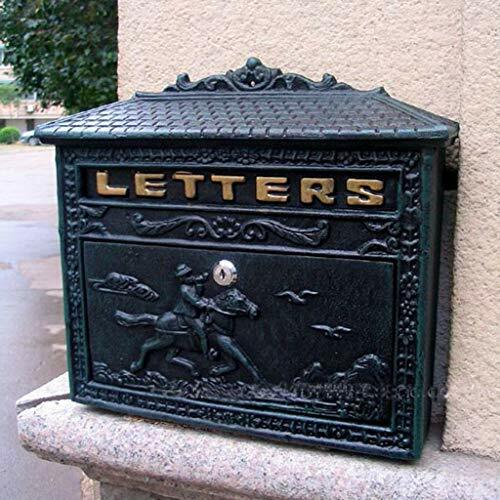 Use the mailbox so you can't miss any news!Mailbox for the reception of mails, letters, correspondence, It can be installed outdoors, in the garden, at the door of the house or office. Product: MailboxMaterial: metalSize: about 33.5 cm long, about 7.8 cm wide, about 25 cm high (without top cover)Colour: BlackDelivery port size: about 28 cm long and about 3 cm highPick-up port size: about 28 cm long and about 13 cm highInstallation method: wall-mountedquantity: 1Mailbox range: community, villa, school, family, hotel, restaurant, etc. [Maintenance Instructions] Wipe clean with a cloth dampened with a mild detergent.Wipe dry with a clean cloth.prompt:This product only sells mailboxes and does not contain other products.Thanks to your understanding, the product will have a 1-2cm error due to manual measurement.I am sorry, due to the lighting effects and the brightness/contrast settings of the display, the color of the website photos and actual items may be inaccurate, thank you for your understanding.100% customer satisfaction, delivery time 10-15 days, return time within 30 days, if you can't receive it within 30 days, please contact us, our goal is to reply within 24 hours. Do you need a secure place for your letters?Our mailbox is highly recommended!If you are looking for a durable mailbox, don't hesitate to order it!Product: MailboxMaterial: metalSize: about 33.5 cm long, about 7.8 cm wide, about 25 cm high (without top cover)Colour: BlackDelivery port size: about 28 cm long and about 3 cm highPick-up port size: about 28 cm long and about 13 cm highInstallation method: wall-mountedquantity: 1Mailbox range: community, villa, school, family, hotel, restaurant, etc. [Maintenance Instructions] Wipe clean with a cloth dampened with a mild detergent.Wipe dry with a clean cloth.Tips:This product only contains letter box,other decorations in the picture are not included.Size Description:Product size measured by hand, please forgive 1-3 cm error.Photo Caption:The pictures are taken from the real objects,as light, angle, different displays and other reasons lead to ther color differences, pleaseunderstand!Delivery Time: Usually we will arrange delivery within 1-2 days, arrival time is 15-20 days, return time: 30 days.If you have any questions, please contact us through Amazon messaging system, we will respond to you within 24 hours and give you a satisfactory answer. Product: MailboxMaterial: metalSize: about 33.5 cm long, about 7.8 cm wide, about 25 cm high (without top cover)Colour: BlackDelivery port size: about 28 cm long and about 3 cm highPick-up port size: about 28 cm long and about 13 cm highInstallation method: wall-mountedquantity: 1Mailbox range: community, villa, school, family, hotel, restaurant, etc. [Maintenance Instructions] Wipe clean with a cloth dampened with a mild detergent.Wipe dry with a clean cloth.Delivery time is 10-15 days. If you are unable to receive it within 30 days, please contact us. Our goal is to respond within 24 hours. 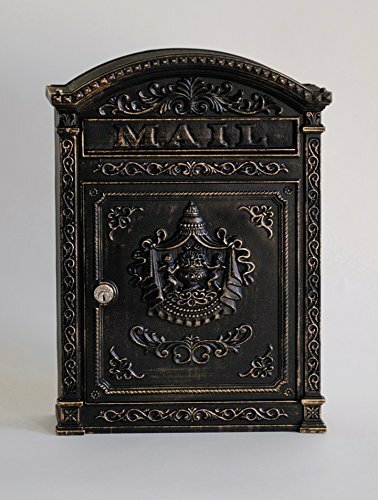 Mailbox for the reception of mails, letters, correspondence, It can be installed outdoors, in the garden, at the door of the house or office.Product: MailboxMaterial: metalSize: about 33.5 cm long, about 7.8 cm wide, about 25 cm high (without top cover)Colour: BlackDelivery port size: about 28 cm long and about 3 cm highPick-up port size: about 28 cm long and about 13 cm highInstallation method: wall-mountedquantity: 1Mailbox range: community, villa, school, family, hotel, restaurant, etc. [Maintenance Instructions] Wipe clean with a cloth dampened with a mild detergent.Wipe dry with a clean cloth.Note:Light shooting and different displays may cause the color of the item in the picture a little different from the real thing. Because it is manual measurement, there will be 1-3CM error, please prevail in kind, thank you for understanding.If you have any questions, please contact us via Amazon Messaging. We will get back to you within 24 hours. And give you a satisfactory answer. View All Free Coupons for NAME from Any Online Store at Warehously Comparison Shopping Website. Order Online Wholesale NAME with Fast Shipping to United States, United Kingdom, Canada, Australia, and Europe at Warehously.com Store. Warehously Store Recommends Bon Jovi Discography, Red Marine Algae 90 Tablets and Nicole Snap - Order Now For Sale Prices.